I am still working my way through the Heritage Farms porterhouse pork chops I bought a while back and the Gonon I picked up at Chambers Street Wines was screaming for a nice piece of meat. Just simply prepared with salt, pepper, olive oil, and cooked on a grill pan, the pork chop was juicy, meaty, rich. 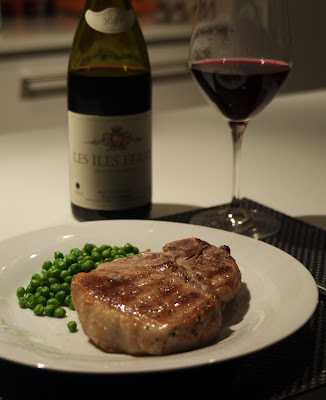 A lovely pairing with the Gonon 2007 Vin de Pays Les Iles Feray. Syrah from young vines in St-Joseph and older vines on the plateau in Ardeche. The wine is smoky, has dark fruits, soft and lush, but with the right amount of acidity. It's even a touch animalistic. I really dig Gonon's wines and I need to try the 2007 St-Joseph soon.